Do you find yourself endlessly stroking, singing or patting your child to sleep? Or hunting for the best soothing music? Or creating very specific routines which turns into a disaster at the slightest deviation? If bedtime has become this drawn-out, ever-so-stressful-but-I’m-trying-to-radiate-calm-energy-so-you-will-go-to-sleep-before-I-scream experience(! ), then it’s helpful to look at whether these soothing tactics & routines are actually being helpful. At various times with both of my children I have fallen into the trap of thinking that I’ll soothe them by rubbing their back so that they will go to sleep faster. To begin with, this can work a treat. It’s lovely, it’s relaxing, boom – they’re quickly asleep. But when your child is upset about anything, they can rely on the soothing technique to stop feeling those feelings. Because they’re not genuinely relaxed, as soon as the soothing stops, they become agitated. When anyone is agitated, sleep is pretty much impossible. Hence a prolonged, increasingly stressful struggle, and that’s your evening gone. – know that this is so incredibly helpful for your child. You’re providing the opportunity for stresses, upsets, etc, to be released, so they are no longer carrying them around, which in turn, should lead to a better night’s sleep (for everyone!). 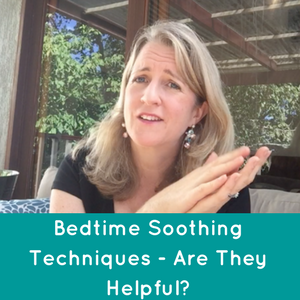 When your child is genuinely relaxed & when they have had the opportunity to release any stresses that have accumulated over the day or from an upsetting event, then sleep comes easily. Yes they will still need connection from you at bedtime, but they won’t need all the distractions & soothing techniques. I’d love to hear how bedtimes are for you and how you go with scaling back on the soothing techniques. If you have any questions you’d like me to answer on video or in my podcast I’m currently developing, please email me. And remember, if you’d like some 1 on 1 support, book in a time today.